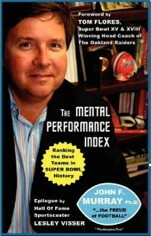 As a sport psychologist, Im always looking for ways to help players gain the mental edge. This can be accomplished in many ways, but the correct attitude and drive are necessary before any technique or strategy can be properly implemented. Since youre on a computer now, lets call it your hard-drive. Whether you are a professional player or coach or just a weekend hacker, its wise to study and understand this internal motivation or essential desire. Before we begin, Id like to share a very simple but effective model of performance that I use in working with athletes. Lets take a look at each area. Talent and physical skills are a combination of your innate ability and what youve acquired through learning. This is the relatively stable factor that changes little. To improve in this area you could turn the clock back and choose better parents, take many lessons, or play tons of matches. High skill and talent level are essential, but never enough. The pages of history are filled with talented failures. Hard work, effort and discipline are fundamental driving forces behind any success. Without these elements, you are spinning your wheels. Your ability to make practices and lessons challenging and your ability to stay properly motivated helps, and provides our main focus today. Mental Skills represent another key area. We often use many kinds of mental skills including the classics of Confidence, Focus, Intensity Regulation and so on. I like to refer to them as mind-body skills because nothing is purely mental. Your thoughts and feelings influence your actions and physical sensations all the time. The quality of your thoughts and feelings change how well you hit the ball and vice versa. But the key is to take this area as seriously as any other area. All three of these major areas come together to produce performance. Notice that I did not say success. Its really impossible to control outcome, but by performing better  youll ensure a better outcome. It also takes a lot of pressure off the student when you focus simply on performance. Let the outcome take care of itself  because it often gets in the way. Allow success to occur. Structure lessons and practices so that it fully challenges you, but where success occurs more frequently than failure. This increases perceived competence and motivation. Reward yourself for proper performance including good effort, sportsmanship and match wins. Praise yourself and others both verbally and non-verbally (comments such as good job, pat on the back). Make learning interesting by varying the routine. Reduce excuse making  it reduces uneasiness but does not promote performance or growth. Take full responsibility for negative outcomes. This increases perceived control. Without perceived control, lower goals are set and effort declines. A downward slide continues and you may take on less and less responsibility. Do not accept mediocrity. Have realistic but high performance standards. Jack Welch at GE fires the bottom 10% of his managers. Rid yourself of useless and harmful habits and see your performance rise. Practice emotional control over anger, boredom, and anxiety. Increase your competitiveness by learning to love the struggle more. Get comfortable with the worst possible situation and the rest is a breeze. This promotes toughening. Draw from the support of others. Talking is very good. Take frequent short breaks. This increases joy and ability to stay fresh, and the ability to bounce back too. Andy Roddick and Venus Williams.